What is the Aga? And why is it the ONLY kitchen appliance you would ever need? It’s a name that has passed into the language itself – novels with countryside settings are referred to as Aga Sagas – and the word immediately conjures up romantic images of countryside living, complete with green wellies and the aroma of fresh baking. So what is it about the Aga that has made it a culinary icon, favoured by everyone from Martha Stewart and Jamie Oliver to Princess Diana and Paul McCartney? Invented in 1922 by Dr. Gustav Dalén, a blind Nobel Prize-winning physicist, this multi-purpose cast iron cooker holds at its core a small burner, which keeps it constantly ready to go and eliminates the need for manual temperature control (hence the absence of any knobs). The multiple ovens and burners maintain different temperatures through variations in the cast iron’s thickness: water can come to a fast boil on one of the top burners, while delicate sauces can simmer gently on the adjoining plate; one oven can cook slowly while another can simultaneously roast or bake at much higher temperatures. And that’s not all – the Aga can also toast bread, heat up the entire room and dry clothes to a crease-less finish. Plus, since it doesn’t blast food with drying direct heat, Aga devotees hold that radiant heat from the cast iron ovens gently cooks food more gently, locking in flavour, moisture and nutrients. Its casting and vitreous hand enameling continue to take place at the 300-year-old Coalbrookdale foundry, UK, a world heritage site that manufactured the first commercially available Aga in 1929. The company continues to build on the original, refreshing the cooker for contemporary needs, such as a range of candy hues that have brought us a long way from Dalén’s first cooker, even as the quintessential design keeps us close to it’s legendary heritage. 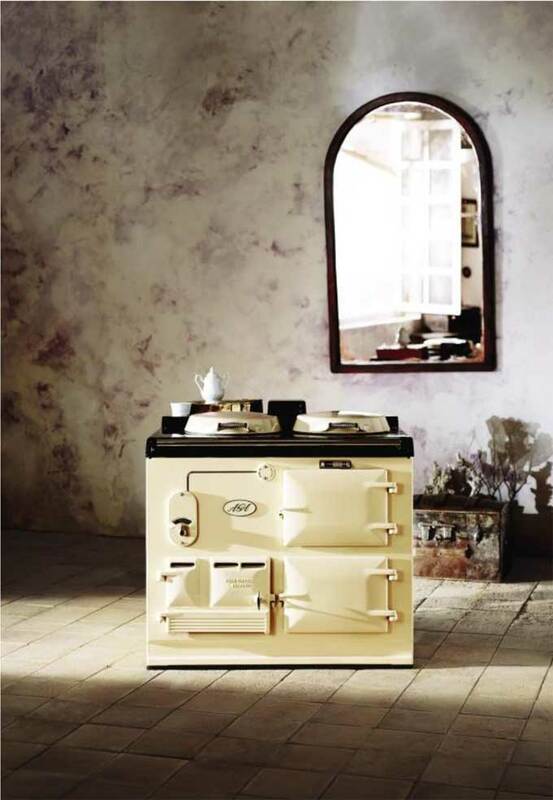 The AGA was voted in a BBC survey one of the top three design icons of the 20th century. But isn’t an Aga seriously fuel-hungry? Can it be eco-friendly? About 70% of a new Aga is now made of recycled scrap iron and innovative bio-fuel, diesel and electric versions make it extremely eco-friendly.